Did you REALLY think I would resist the urge to show you a Brady picture? I think not. This is Brady on our bed about this time LAST year. Can you believe how little he is? But totally the same look huh? He's just SLIGHTLY less bald now. 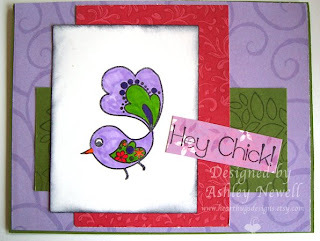 This card is for the Friday Fun Challenge. I first heard about it on Jimmi's blog but this week I saw it on Sherry's blog first. It's a challenge to be inspired by your bed. That's the reason why I posted a picture of my bed. Now, it's not the BEST picture to actually show you my bed. But it's Brady. I HAD to. Also, those are not the normal sheets and pillow cases. A year ago *someone* was quite the spit up monster. well. I used Unity's Hey Chick for the main image and the sentiment. On the small piece of green card stock, I used the top of one of the Unity Tiny Trinity trees and some Versamark to make a patterned paper. This is also for Beate's weekend sketch challenge and for today's limited supplies challenge where we couldn't use any embellishments. Brady is such a doll! My oldest son used to sleep like that - arms spread open - he would get his little hands stuck between the rails of his crib all the time. We moved him into a twin bed when he turned ONE! He's 16 and 6'-3" now...I should've known then I'd never find a bed big enough for him!! lol. I love that blanket with all the jewel tones and patterns!! I think your card captures it wonderfully! !